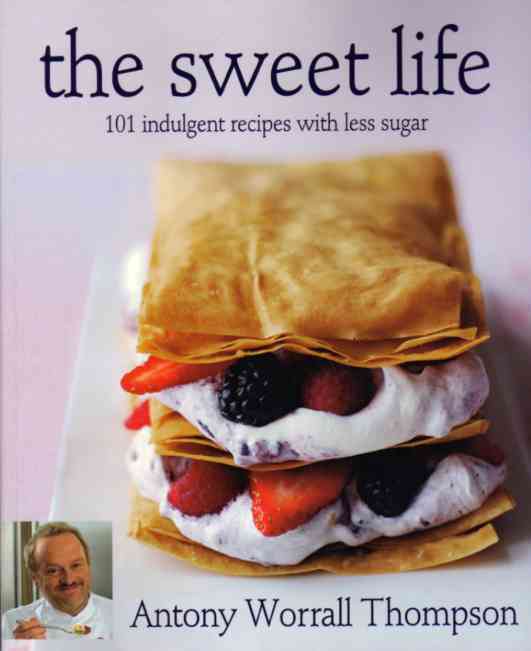 The Sweet Life by Antony Worrall Thompson has arrived just at the right time. I make no apologies for being enthusiastic about a book that focuses on using a sweetener instead of sugar. I hadn’t given the subject of diabetes much thought till I met Claude. He misses out on so many good things because his wife doesn’t have the recipes to make sweet things that he can eat. If he goes out to friends for a meal then the dessert will always be a problem. He will love this book……once I have translated it into French! The book starts with a foreword by Melinda Messenger who has contributed eight of her favourite low-sugar recipes that are simple and popular with family and friends. The sugar is replaced by Splenda, a low calorie sweetener. Well, Melinda looks good on it! Antony was told that he was heading towards diabetes, but he is a chef with a passion for food and he still wanted to make delicious meals and treats for himself and his family. Splenda is easily used in cooking. It isn’t those little tablets, it looks like sugar and you use the same volume as sugar so it makes a good substitute. There is a section on using the product, so no need to panic. All the photographs, and there are pictures for most of the recipes, make the food look every bit as gorgeous as you would expect from an “ordinary” cookbook. The truth is that the cakes, pies, mousses ARE as gorgeous as the sugar-laden alternatives. We are talking about seriously good puds. You could tuck into any of them and not feel that you are making a sacrifice for the sake of good health. Antony even has chocolatey things like Homemade Chocolate-nut Spread. It’s a low-sugar alternative to that famous one. Easter Egg Brownies would be a lovely one for the kids….Ok, all of us. Who could resist Baked Cheesecake with Marsala-steeped Raisins? No sugar! Or Greek Lemon Pudding. No sugar! Each recipe has nutritional information and I guess you would still have to keep an eye on that if you are diabetic. Although the refined sugar has been replaced by Splenda, there are still natural sugars from fruit as well as some recipes that use honey. All the information is there to help you so it’s ….a piece of cake! This isn’t just a book for those with health problems. Most of us could do with cutting back on the sugar but it’s good to be able to have great sweet things to eat while we are doing it. But let’s consider cooking for our friends with diabetes – invite them over and present them with a luscious dessert they can safely eat and enjoy! Antony Worrall Thompson has done a smashing job. I thank you, Claude thanks you, and a lot of other people will as well.